A beginning to end all beginnings! THE IMMORTAL NINTH : The SLO Symphony’s 50th season finale concert will feature the world premiere of composer Craig Russell’s Celebrations, followed by Beethoven’s immortal Ode to Joy. Don’t miss out! With this charmingly absurd statement, composer and Cal Poly professor Craig Russell explained his latest effort, Celebrations!, a musical composition that faces the challenge of sharing a program with “one of the greatest accomplishments of human history.” Namely, Beethoven’s Symphony No. 9. I imagine David tossing his stone aside and laughing at the sight of the lumbering giant Goliath. Commissioned by SLO Symphony music director Michael Nowak, Russell’s work could just as easily be titled Conversations. It’s comprised of two orchestras, the youth orchestra and the so-called “big orchestra” engaging in a dialogue between the ages. 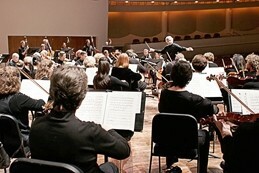 Russell’s newest work debuts at the finale concert commemorating the SLO Symphony’s 50th season, a beginning to signal an ending. But the genesis of the piece, Russell later elaborated, seated at the piano in his intellectual’s apartment, was anything but celebratory. Around the time he was supposed to be composing Celebrations!, he said, his marriage of 36 years disintegrated. And in the darkness of it all, as he sat down at the piano bench—in a town that had just been proclaimed America’s happiest—he was stricken by the despair of the situation. His marriage to the woman he thought he’d be with for the rest of his life was suddenly gone, and here he was leading the life of a bachelor, composing a work called Celebrations!. The only thing that brought solace was the thought of a dear friend in Barcelona, an accomplished Catalan composer named Anna Cazurra. Russell began spelling out the elegant simplicity of her name in the only language that made sense. A-flat, A-natural, A-natural, A-flat: it was her name in music; backward and forward the same. Then he spelled his own first name, Craig. There’s no “R” or “I” in the musical scale, but this was a trifling matter. He would pretend, assigning a note to a letter and moving on. It was a start, and from there, the names of other friends flowed from the piano keys in the fluid guise of notes, and the conversation began to take shape. From a tentative beginning, Celebrations! twists through America’s musical landscape, away from the grasp of classical, through funk and sultry blues, then back to classical, spelling out his muse’s name in every movement. The musical “environment” changes, he explained, but the character, Anna, remains the same. He explained this patiently to another Anna—this writer—who, music illiterate, eyed the notes with an appreciative lack of understanding and nodded. “It’s like having Luke Skywalker show up in Little Miss Sunshine,” he elaborated. Then The Great Escape. Then The Matrix. At the piano, he narrated a funk section of the piece: Now we’ve put Luke Skywalker on another planet! Now, James Brown meets B.B. King meets Beethoven! The piece, which clocks in at around 20 minutes, was originally meant to be a mere five, a sort of joyous prelude to Beethoven’s masterpiece. But Nowak, upon reflection, wanted more substance to counter the weighty masterpiece that would follow it. He phoned Nowak, who had been thinking along the same lines: a kind of call-and-response between two generations of musicians. “I’ll probably never get the chance to compose for two orchestras ever again,” Russell said. After an intermission, Beethoven’s exultant, 70-minute Ode to Joy, played by more than 200 musicians, will resound throughout the Performing Arts Center—the first time since the venue opened its doors in 1996. It’s almost a scandal, really, that listeners are privy to something Beethoven himself—possessing, at the end of his life, just four senses—never heard. Perhaps joy, like music, is a thing best understood by those who have lived in its absence. Arts Editor Anna Weltner spells Anna with words and Weltner with chortles. Send comments to aweltner@newtimesslo.com.